ABOUT FORGETTING… | Jots from a Small Apt. 1 January – take down Christmas tree. Pack. Store. 26 December – Christmas tree down. Packed. Stored. Five-day head start on usual Christmas tree take-down. Thirty-one plus five extra days of forgetful bliss. Thirty-one plus five shades of Joseph Campbell. grrrrrrrrrrrrrrrr. i’ve tried and tried and tried to nudge, kick and then HURL a comment in your direction! now i’ve forgotten what i wanted to say! 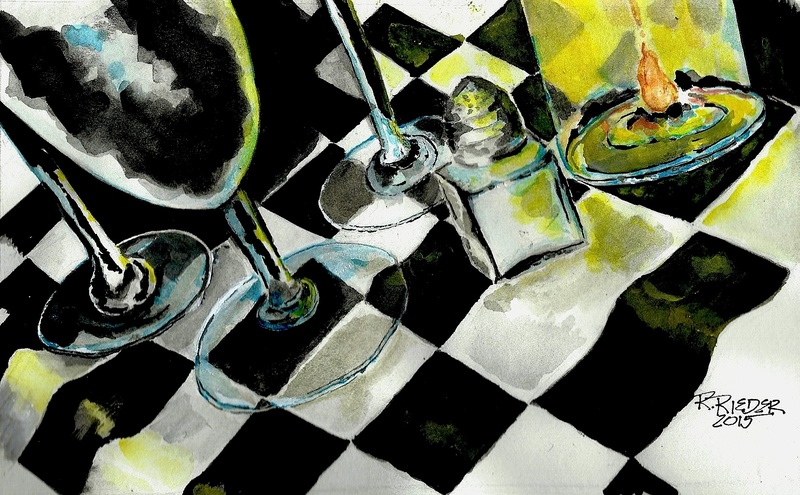 1. i love the black and white and touch of yellow and the oh so lovely way that you paint… you definitely have your own stye.. love the header image too.. it’s like sitting cross the table from you! 2. when i first read the title to your post, i thought of this song: i hope it’s david gray’s song by that name.. the page wouldn’t load! message received (embraced) and thank you so much, especially from your comment from a few days ago which i have not answered yet. i don’t want to resort to sleeping in a chair like i once did 20 years ago.. time to get answers, which could not be found back then.. technology’s come a long way since.. it willl be my luck that im allergic to acrylic paints! ha! Love the black and white of it and that yellow glow, but the perspective is the most fun about this. Skipping February? Great idea! L. I’ve had this one sketched for about 6 months!. It’s a photograph I took…but with a new camera and the image was blurry because I didn’t focus the lens properly. It was, however. simple but eye catching….and most fun to paint. Love the black and white checked table cloth on a tilt. The glasses, candle, salt shaker…perfect! don’t put up a Christmas tree…no room in the apt. Love the new header. Poem brilliant too! Thank you, Anne, for dropping in. Too wet for gardening where you are…more time to paint! Love your work and your words. R.
You coming to Round-Up this year? Image from a photo I took without focusing and obviously the shutter snapped too soon, when living abroad….yrs. ago. Have had this sketched for at least 6 months. It was a fun one! Thank you for your comment. I’ve been here 4 times already last night and today to marvel at this luscious painting. The first 3 times, I was grabbed by the blackband white checkers, and today it’s the yellow – that indescribable yellow. Not quite mustard, too deep for butterscotch or daffodil. Love it! Appropriate title that…ABOUT FORGETTING…I’m lost in the morass of WP changing how we comment to each other. It would be easier if I hopped a plane and delivered a verbal message. Thank you Sammy for your comment(s)…always smile makers!!! You got sun? R.
Oh, I hear you on the WP morass. Honestly it’s not writing block that keeps me from posting; it’s knowing I’ve got to wrestle with the damn formatting and Beep Beep Boop BUGS which takes all the fun out of it. I need to hire a Personal Happiness Engineer !! We have lovely warm sunshine here – golfing weather. I feel SO guilty, but lucky. How about you? I love that drawing! I’m a sucker for black-and-white checkered patterns. Love it in floor tiling, too. Wish I had it in my house. Geez…I think I’m lost. I just hate the way WP has revamped the comment section. Hmmmmm…anyway….anything checkered, striped, circled, vertical or horizontal…or not….would be favourites in my eyes. But yes….black and white…!! I’m with you on the new comment format. Not sure what WordPress was thinking with that one, but it’s easy to miss comments. I hope they change it back. Ah ha … three glasses … must be Dale & I with the executioner in Siena … and I know that’s my glass because I favor red wine … then again, it’s not empty, and I only leave glasses empty. i also favor pepper over salt, so my fingerprints probably aren’t on that salt shaker. Meanwhile, a special someone has a February birthday. … now I await Dale’s response. Whose having a birthday? Dale? Really? Nope.. not me! I’m an April baby… I only leave glasses empty as well so we can fight over who’s glass belongs to whom. The important thing is we’re together, so we can hash it all out face-to-face! “Superficial Procrastinating”?? I love it! Have a great February! What’s one month in the year? Must we always be on the ball ALL the time? I think not. New month, new slate, more things to come and go and be forgotten! Perfect way to look at each day! Only noticed the pepper because Calvin noticed it first! Let me know what time is good for you. What about in the evening…at the end of our day(s)? Say 9p (you)? What works?? At least you didn’t talk about me this time! Not sure if I should plead the Fifth, open a fifth, or simply admit guilt. All of the above….just to be on the safe side! Wondering if I should Skype with bloggers? Well … no doubt you’ll snitch again … maybe even make something up! Hmmm…I dunno; have you given me reason, lately? Gone but not forgotten. Oh, to be able to forget. But, it is only 28 days….Happy Valentines Day in advance. I love your extra five days you found in December. Sheldon…GREAT good morning! Yes, to Joseph Campbell and his profound wisdom. First thought……so it really is 2015, As for the brush strokes, why no pepper. You made me smile, even amidst influenza eh. Thanks for the medicine. I took this photo a while ago…liking the simple composition. Funny…even though you are ill…noticing no pepper. Geez…what was I thinking???? In any event…hoping you are on the mend! For the first time, no tree this year, no decorations other than outside wreaths, took all of 10 minutes to store away. Something to be said for minimalism in our older years.